Today (March 2, 2019) is #NoPhoneDay from OnePlus - a well known smartphone brand! What is No Phone Day? Read it. Switching off. Go water some trees. Or. Unplug. Switch off. Get offline. But would you like to know what is No Phone Day? If yes, you can read manifesto to understand what #NoPhoneDay is about - http://onepl.us/NoPhoneDay or Google about NoPhoneDay. OnePlus introduced the power of 5G at MWC2019. You can check about their action in OnePlus official recap. The Mobile World Congress (MWC) 2019 brought upcoming many gadgets and one of them was from OnePlus brand as well. This time the expectation was high from MWC 2019 and OnePlus. 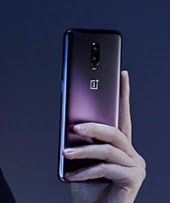 The expectation was including upcoming OnePlus 7 smartphone and other associated gadgets. The brand usually launch its first version of the phone in May month every year. So, the time is very near for the launches. OnePlus market and business is usually well since they introduced the high-end smartphones in a competitive price. The less chances of their device repair as well. Some of the mobile is insurance covered too. The customer satisfaction is high. All in all, the brand tries its best to give the top device in a decent price. OnePlus 7 phone will launch with the latest and advance processor like Qualcomm Snapdragon 855 chipset, higher RAM and ROM ranges, 5G connectivity, WARP charger and many more. If you are looking for OnePlus 7 or OnePlus 7T Mobile Phones detail like expected launch date, release date, price, key features, technical specifications, first impression, unboxing, review and hands-on etc. then we would cover them for you. Time being you can also check OnePlus 6T McLaren edition and OnePlus 6T normal edition other than OnePlus 6 device. We just awaits for OnePlus7 official announcement to do so. We also waiting for its leak and speculation anyhow to share with you all. Stay tuned for further update on OnePlus 7 and OnePlus 7T smartphones.